As per latest RTI Reply, SSC will soon release the SSC Exam Calendar 2018-19 Examinations. Also SSC CHSL 2017 Notification is expected to be released on time (18.11.2017). 2) Tentative calendar 2018 uploading date. 3) CHSL 2017 Advt date. 4) Current status of vacancies of MTS 2016. 6) procedure to obtain descriptive answer sheet of SSC exam. Point 4&5. 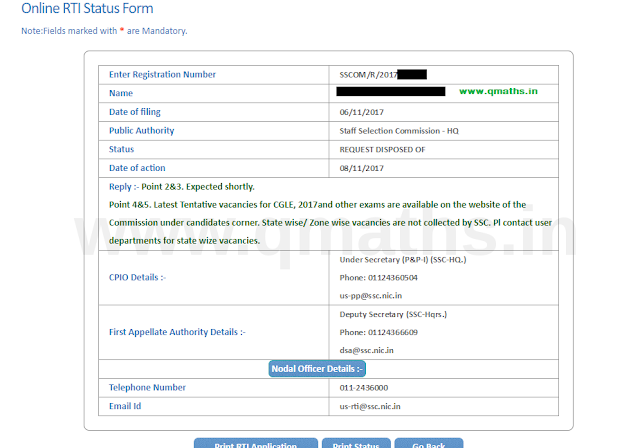 Latest Tentative vacancies for CGLE, 2017and other exams are available on the website of the Commission under candidates corner. State wise/ Zone wise vacancies are not collected by SSC. Pl contact user departments for state wize vacancies.